Progress and wealth creation are crucial for society. For when economies fail to prosper, stagnation and social malaise soon follow. Success demands change ? and change demands reform. The lessons are all around us. Countries that embrace free-market reforms experience rapid improvements in living standards This raises the question: Why don?t more nations follow their example? 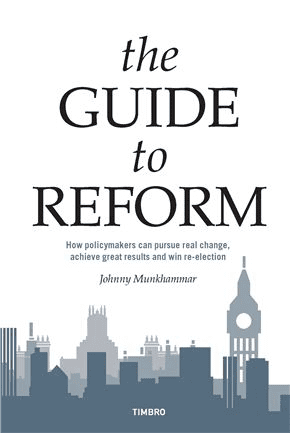 Johnny Munkhammar examines the political obstacles to reform and identifies ways round them. He shows why reforms are needed and which direction they should take, drawing on the experiences of more than a dozen reformist countries. Munkhammar also dispels the myth that reform is invariably politically hazardous. Indeed, reform governments have almost always been re-elected ? at least once. This book offers hands-on advice to policymakers, and shows them how to turn words into action. For more information, please visit www.guidetoreform.com.